In 1948, the State of Israel created a Jewish majority by destroying over 500 Palestinian towns and driving over 700,000 Palestinians out of their homeland. Ethnic cleansing continues today in the form of expulsions and Jewish-only settlements. Israel expels Palestinians, separates Palestinian families, prevents Palestinian travelers from returning home, makes Palestinian living conditions unbearable, and commits outright assassination and murder of Palestinians. Palestinians are driven off their land in the Occupied Territories to make room for Jewish-only settlements. These illegal settlements are funded by the Israeli government and are strategically placed to annex farmland and water resources. Israeli Jewish settlers have rights that are denied to their Palestinian neighbors. For over 60 years, Israel has defied international law by refusing to let Palestinian refugees return to their homes; the refugees of this expulsion and their descendants today number in the millions. The 1993 Oslo Accords created a powerless Palestinian Authority whose only real authority was to maintain the military occupation for Israel. The 2000 Camp David II talks offered Palestinians not a state, but a series of reservations, subdivided by Israeli settlements and settler roads, controlled by Israel and the Israeli military. Through all peace negotiations, Israel has continued building more Jewish-only settlements, driving more Palestinians off their land, and killing more Palestinians. THE UNITED STATES SUBSIDIZES ISRAEL with more annual aid than we provide to all of sub-Saharan Africa and poverty-stricken Latin America combined. The U.S. also provides Israel with military technology: our helicopters, drones and bombs are killing Palestinians, costing us enormous amounts of taxpayer funds, and doing severe damage to our national security and international relationships. This conflict is not a struggle between equals. This is a powerful, well-armed state imposing a military dictatorship on another people. 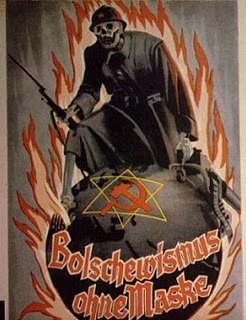 "There is much in the fact of Bolshevism (Communism) itself, in the fact that so many Jews are Bolshevists, in the fact that the ideals of Bolshevism at many points are consonant with the finest ideals of Judaism." —The Jewish Chronicle, April 4, 1919. "According to the data furnished by the Soviet press, out of 556 important functionaries of the Bolshevik State there were in 1918-1919: 17 Russians, 2 Ukrainians, 11 Armenians, 35 Lets, 15 Germans, 1 Hungarian, 10 Georgians, 2 Poles, 2 Finns, 1 Karaim, 457 Jews. As the decades past byafter the fateful year 1917 Judaized Khazars kept a firm hand on the helm of the government in the occupied land of Russia. In due time they built a bureaucracy to their heart's desire." —Robert Wilton, a long time Russia correspondent for the London Times, said in his book "The Last Days of the Romanovs"
"There is now definite evidence that Bolshevism is an international movement controlled by Jews; communications are passing between the leaders in America, France, Russia and England, with a view to concerted action." —Directorate of Intelligence, Home Office, Scotland Yard, London, in a Monthly Report to Foreign Embassies, 16th July, 1919. "In everything, we are destroyers--even in the instruments of destruction to which we turn for relief...We Jews, we, the destroyers, will remain the destroyers for ever. Nothing that you will do will meet our needs and demands." —Maurice Samuel, You Gentiles, pages 152, 155, and 147. "The Jewish people as a whole will become its own Messiah. It will attain world dominion by the dissolution of other races, by the abolition of frontiers, the annihilation of monarchy and by the establishment of a world republic in which the Jews will everywhere exercise the privilege of citizenship. In this New World Order the children of Israel will furnish all the leaders without encountering opposition. "Whosoever was the mind that conceived them possessed a knowledge of human nature, of history, and of statecraft which is dazzling in its brilliant completeness, and terrible in the objects to which it turns its power. It is too terribly real for fiction, too well sustained for speculation, to deep in its knowledge of the secret springs of life for forgery." -The Dearborn Independent, July 10th, 1920. "The United Nations is Zionism. It is the super government mentioned many times in the Protocols of the Learned Elders of Zion, promulgated between 1897 and 1905." -Henry Klein, New York, Jewish Lawyer, in Zionism Rules the World, 1948.